Above is a photo of one of our recent installs in Sonoma, CA. This iron entry door revamps this entryway to leave a fresh and lasting first impression in comparison to the original wood door in its place. Our customer wanted a home that they believed belonged in Sonoma and we were able to deliver exactly what they were looking for. As a resident of Sonoma you have the ability to walk down the street, or around the block or maybe even right out your back door so see the rolling hills of wine country. To live in such a beautiful place is so rewarding and why wouldn't you want your home to raise to the challenge of matching its beauty. Let Signature Iron Doors create a custom design to match your style and home and let yourself create your own paradise in this vineyard utopia. 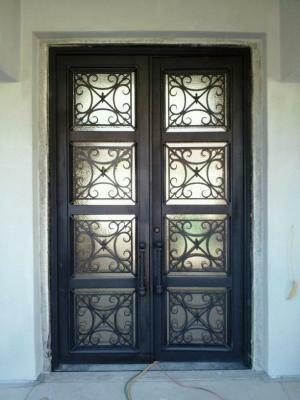 We invite you to visit our website to see how Signature Iron Doors can help you with your iron needs.